The School of Greensboro Ballet's Children’s Dance Program has a well researched curriculum called Leap ’N Learn, just for children ages 3-6. This program is sensitive to children’s physical, emotional, and cognitive development. Leap ’N Learn was originally developed to help young dancers prepare for formal ballet classes. Since then, it has grown into a program that encourages creativity, self-expression and fundamental movement skills. In class, our young students learn to take turns, how to make basic formations (lines, circles, etc. ), basic ballet terminology, posture and how to work with a partner(s). They work on musicality and rhythm as well as stretching and strengthening their muscles. They also work on gross motor skills which are fine tuned as they grow older. Creative games are played so that the children can learn without even realizing it. So in other words, the children are just having a lot of fun! These games are also played so that the child can reach into their imagination and think on their own, as well as outside the box. Everything is age appropriate and the children are taught in a manner that coincides with how they are developing mentally and physically. Sweet Heart Week - wear Red or Pink this week & bring Valentine's for your dance classmates. NEW this year! Princess Week (leading up to our performances of "Once Upon A Time") and Snow Week (in January, 2019)! Click HERE to download our 2018/19 Dancewear Requirements. Click HERE to download our 2018/19 Student Handbook. Want to try a class for FREE? 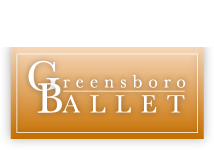 Email greensboroballet@yahoo.com or call 336-333-7480 to set up your FREE class today. NEW! This year's 2019 Concerts will be in the Van Dyke Performance Space on the first floor of the Greensboro Cultural Center on Saturday, May 18, 2019! Children's Dance Concert fees are $35 for the first child, $25 for each additional child. This includes your child's costume and FREE admittance for everyone in your family and any other friends or guests. Your dancer is only required to be there between 1 - 1.5 hours. This includes prep time, the concert (your child will be on "stage" the entire 20-30 minutes) and a post celebration. After the concert, stay for a snack and punch mixer and for our Carnival , where the children (dancers and siblings) can play games and win prizes. Along with some brief class-work demonstrations, your child's class will perform their own "Story Ballet" that they have created together with their instructor. Overall, we offer low-stress, intimate and fun concert experiences that both our students and families truly enjoy and appreciate. For a complete listing of our current classes, click on any of the photos. Don't have a child old enough for our Children's Dance Program? Try some Half-Pint Harmonies classes (for ages Infants+) at GB on Tuesdays at 9:30am. Click HERE for schedule & more info.